PRODUCT DESCRIPTION: Small donut shaped and sized objects which release bacteria into water where mosquitoes are breeding. When the larva feed on the bacteria, they die. WHERE TO USE IT: Anywhere. This bacteria will not hurt pets, children, birds or wildlife. Great for use in bird baths, ponds, lakes, swamps, rain barrels, clogged gutters, sewers which hold water, retention ponds, drainage ditches, slow moving streams, bottoms of planters and anywhere water is able to accumulate and provide mosquitoes a place to reproduce. RATE OF APPLICATION: One dunk will cover about 100 sq/ft of surface area. You can break it up if treating small areas and tie it to a weight or anchor of some sort when applying it to moving water. Great Product, Great Service. 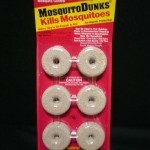 We've been buying Mosquito Dunks from BugSpray for years. They have the best price and delivery we've found. We chuck 8-10 dunks per month around our 'pond' (95' long, 6'-15' wide); 100 dunks from Bugspray costs about $1 per dunk so it's very economical to keep our yard mosquito free all summer long even with a very large water feature in the yard (in Texas). The dunks don't appear to affect frogs or birds (which we have plenty of). 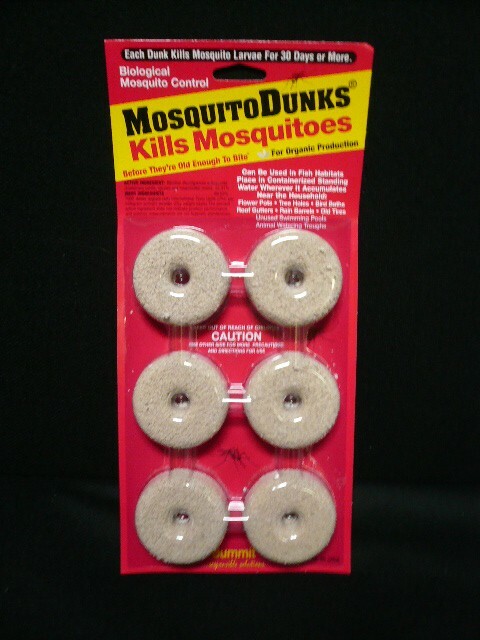 We're completely sold on using Mosquito Dunks for mosquito control (elimination!) and will continue to buy them from BugSpray.